Board of Directors meetings are usually held the 2nd Monday of the month at 5:00 pm at the Red Lodge Area Community Foundation Building. All members are welcome and encouraged to attend. 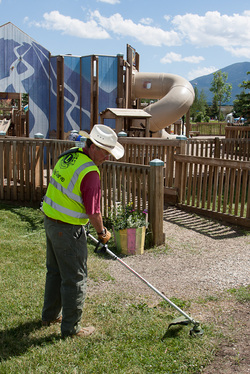 Lions Park maintenance is a huge challenge. The park is divided into work zones A, B, C with Zone A starting at the north end and includes the basketball courts and horseshoe pits, Zone B is in the middle and includes the playground and ice skating area, and Zone C is at the south end near the gazebo. If you can possibly help out once in a while, it would be greatly appreciated. Call one of the Zone chairmen and let them know. They will provide you with the proper training necessary to complete the task at hand.